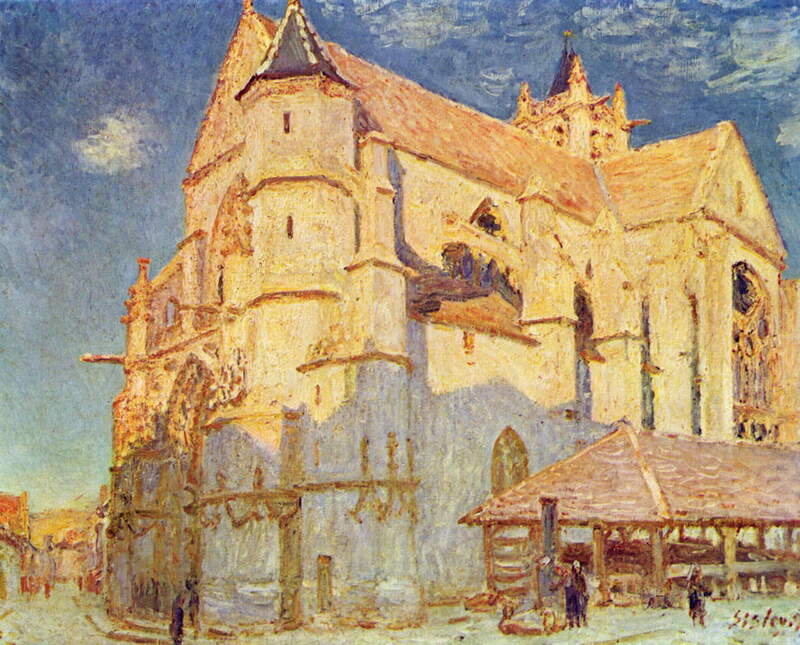 Alfred Sisley, The Church at Moret (1893), oil on canvas, 65 x 81 cm, Musée des Beaux-Arts, Rouen. WikiArt. 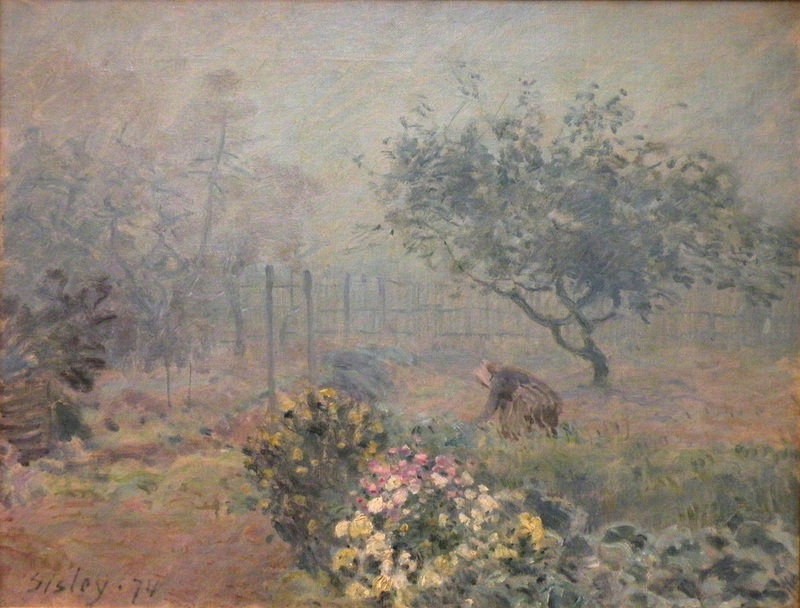 A woman tends plants in a garden on a foggy day. One of the most atmospheric paintings by any Impressionist, it is mystifying that Sisley’s wonderful landscapes have been all but forgotten. A foggy day in a garden, a solitary woman crouched low, working on the plants. The foreground is divided into two. On the left is bare earth, behind which is low patchy vegetation, and at the left edge a shrub and low wooden planked structure. In the centre are bright flowers, yellow, white, and carnation pink, prominent in impasto. On the right the flowerbed changes along the lower edge of the canvas into large-leaved green plants, perhaps one of the cabbage family. Behind those, on the right, is further low vegetation, at the far edge of which is the woman, crouching down. She wears a white hat, dull green full-sleeved top, and a green striped skirt, and faces the ground just in front of her, her left arm reaching down to the plants. Behind the woman is a low tree, perhaps a fruit tree, which fills much of the right upper quadrant of the painting. It is in full leaf. On the left of centre a series of posts about two metres high are lined up, receding into the centre of the painting. Further to the left are more distant and vaguer forms of higher trees, and ridges of soil running parallel to the posts. A fence of palings about two metres tall crosses the middle distance, from behind the trees on the left, behind the fruit tree in the centre right, to the right edge of the canvas. Behind the fence on the left are further high trees, more vague in the fog, and there are even vaguer indications of other high foliage and blurs across the background. Alfred Sisley, Fog, Voisins (1874), oil on canvas, 50.5 x 65 cm, Musée d’Orsay, Paris. EHN & DIJ Oakley. Lighting is diffuse and no cast shadows are shown. The fog is dense, grey, pale blue, yellow presumably with weak light, and pervasive. Alfred Sisley was born on 30 October 1839 into an affluent Anglo-French family living in Paris. In 1857, he went to England for the first time, to study commerce in London, where he saw the works of Constable and Turner, and decided that he wanted to paint instead. Returning to Paris in 1860-1, he then studied at Charles-Gabriel Gleyre’s studio alongside, and in friendship with, Monet, Renoir and Bazille. 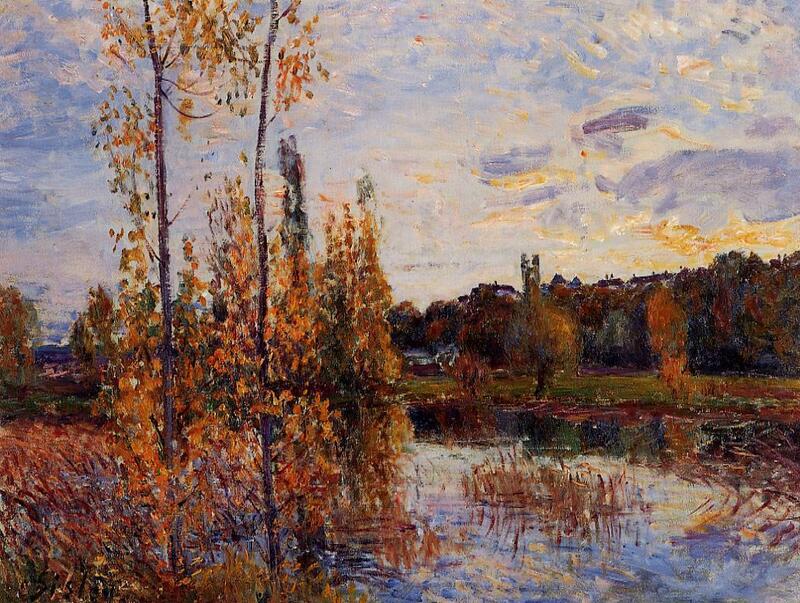 They painted together plein air, Sisley being comfortably supported financially by his family. Alfred Sisley, The Canal Saint-Martin, Paris (1872), oil on canvas, 38 x 46 cm, Musée d’Orsay, Paris. EHN & DIJ Oakley. During the 1860s he produced landscape paintings in the style of the Barbizon School, which were well received but did not sell. He enjoyed modest success in the Salon, two of his paintings being accepted in 1866, but was refused in subsequent years. He lived in Bougival with Eugénie Lesouezec from 1866, but during the Franco-Prussian War in 1870 their home was overrun and most of his works destroyed. 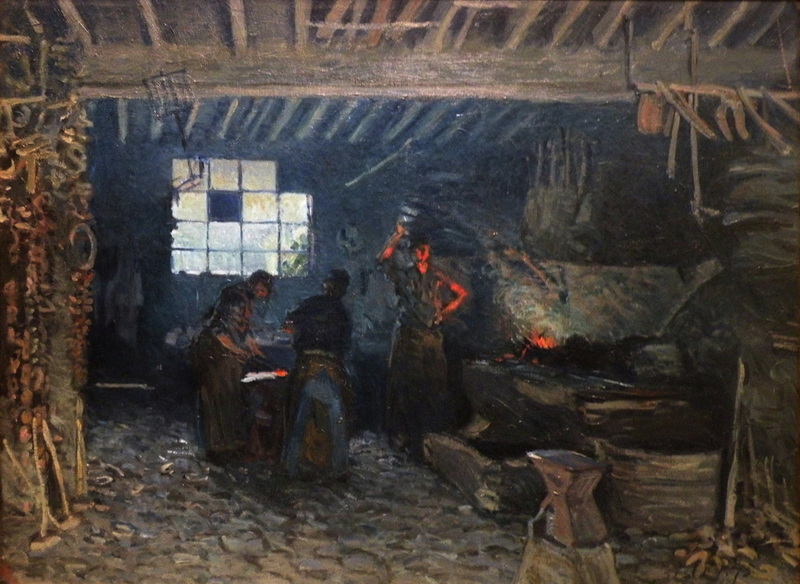 Not only did they lose all their possessions, but his father’s business collapsed, and for the rest of his life Sisley and his family survived in abject poverty, his paintings selling little, mainly to patrons including fellow Impressionist painter Gustave Caillebotte, the famous singer and actor Jean-Baptiste Faure, and a pastry chef. 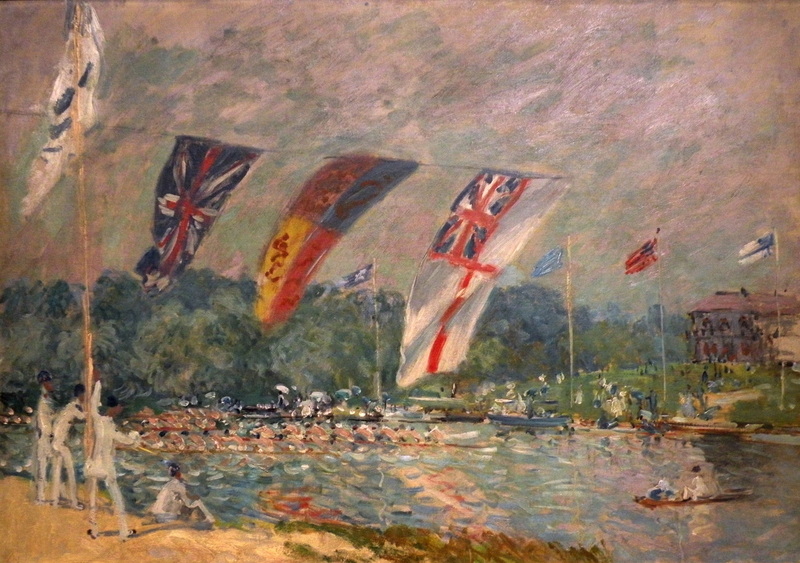 Alfred Sisley, Regattas at Molesey (1874), oil on canvas, 66 x 91.5 cm, Musée d’Orsay, Paris. EHN & DIJ Oakley. In 1872 he stayed with Monet at Argenteuil before moving to Voisins, near Louveciennes. He showed six paintings in the first Impressionist exhibition of 1874, eight in the second of 1876, 17 in the third of 1877, and 27 in the seventh in 1882. His patron Faure took him to England in 1874, where he painted scenes around London and the Thames. On his return his family moved to Marly-le-Roi, where he painted extensively. In 1877 they moved again, to Sèvres, then in 1880 they became more settled in the area near Moret-sur-Loing, although still moving quite often. 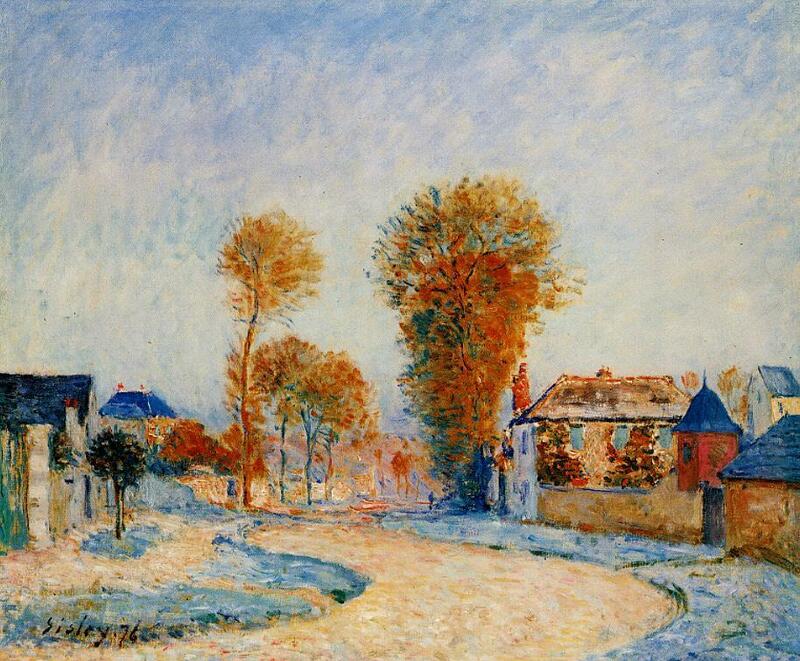 Alfred Sisley, The First Hoarfrost (1876), oil on canvas, Bridgeman Art Library. WikiArt. A visit to the Isle of Wight in 1881 failed when his canvases were not delivered in time, and he could not afford to buy replacements. He finally received formal recognition by election to the Société Nationale des Beaux-Arts in 1890. In 1897, he and Eugénie travelled to England and Wales, visiting Falmouth, then South Wales where they married at last in Cardiff Registry Office. He painted the coast there, including views around Penarth and Langland Bay. The following year his wife died, and he died a few months later, on 29 January 1899. Despite leaving almost nothing, fellow Impressionists organised an auction to support his surviving children, which raised a very impressive total. 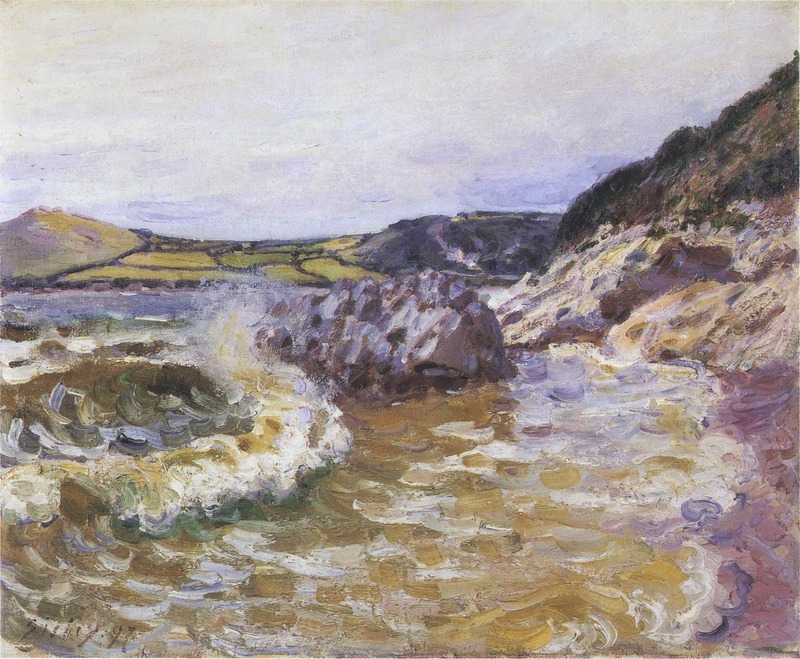 Alfred Sisley, Lady’s Cove, West Side, Wales (1897), oil on canvas, 54.3 x 65.3 cm, Bridgestone Museum of Art, Tokyo. WikiArt. Strangely, Sisley has become the Impressionist who never was: all mention of him was excised from the Tim Marlow / Phil Grabsky TV series The Impressionists, and from the BBC TV biopic series The Impressionists, although the latter showed several substantial scenes from the Gleyre Academy days. However serious art historians including John Rewald and John House have consistently included extensive references to him, his paintings, and his importance to the Impressionist movement. It is very hard to see why so few people know of his importance in Impressionism, or of the masterly qualities of many of his works. 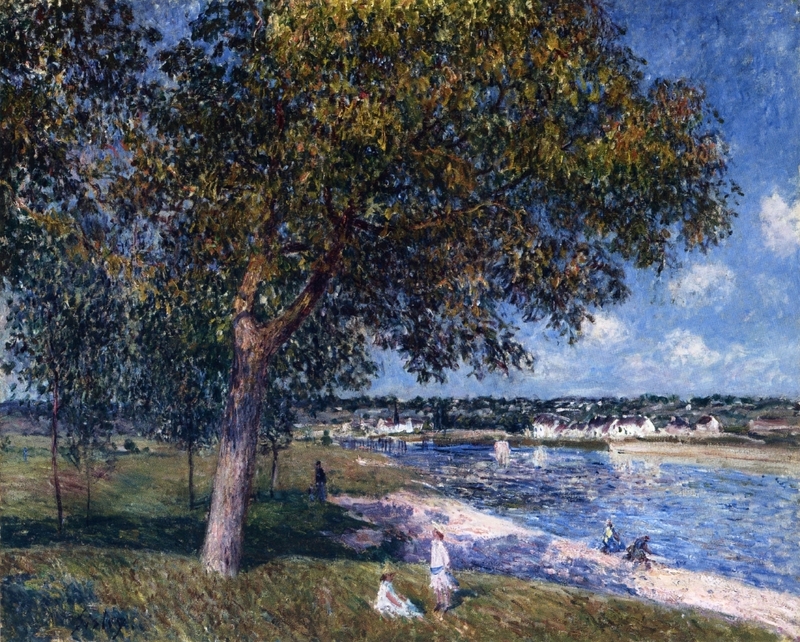 Alfred Sisley, Saint Mammès (1885), oil on canvas, 54 x 73 cm, Private collection. WikiArt. 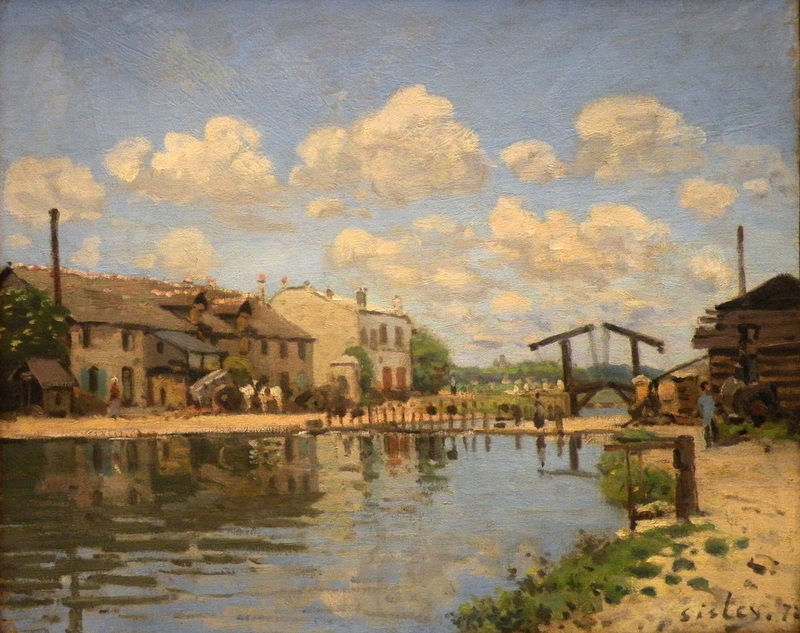 Most critics, including Richard Shone, consider that Sisley’s work went through a bad patch around the 1880s, but I hope that the examples shown here illustrate that, whilst some of his output then was inferior to his best periods in the 1870s and 1890s, he still created many wonderful landscapes. 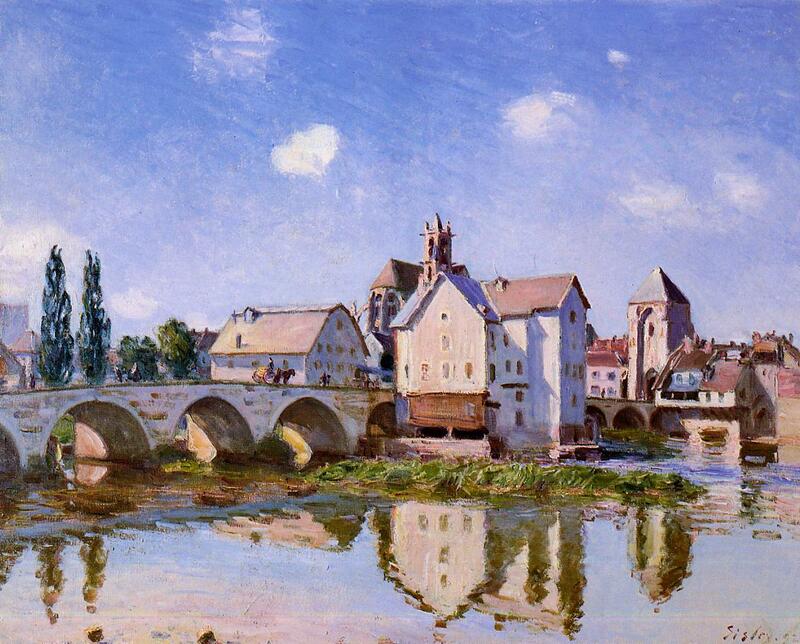 Sisley was one of the first Impressionists to – perhaps unintentionally – paint series of and around the same motif, from around 1875, although he did not do this formally until he painted a dozen views of the church at Moret in 1893, whilst his friend Monet was engaged in a similar enterprise in Rouen. 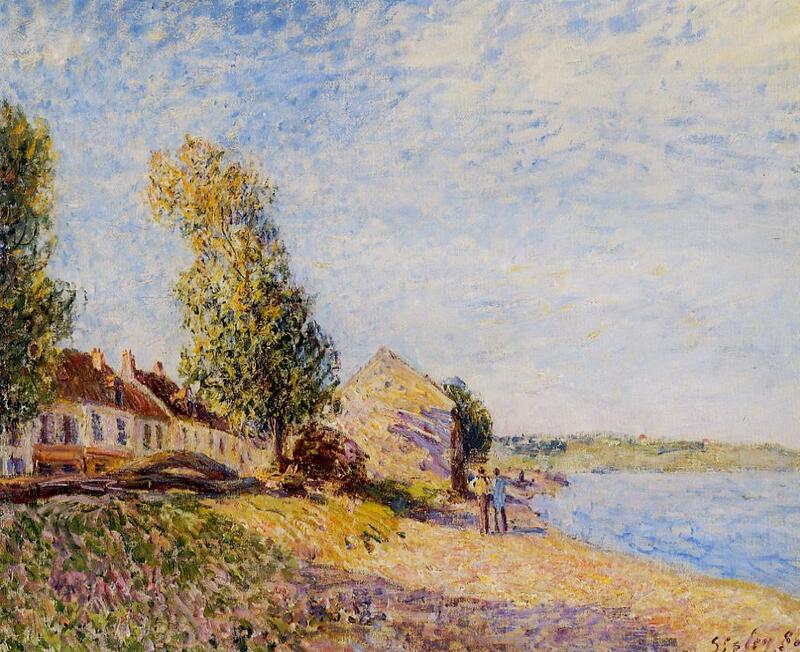 Whilst Monet’s were sold to bolster his increasingly affluent position, Sisley’s have only very recently become appreciated for the masterpieces that they are. Alfred Sisley, l’Etang de Chevreuil (c 1888), oil on canvas, Private collection. WikiArt. For Sisley was not as self-promoting as Monet, was too reticent, and too devoted to painting pure landscapes even when he could ill afford the paint. Alfred Sisley, Moret Bridge in the Sunlight (1892), oil on canvas, 65 x 81 cm, Private collection. WikiArt. One of the central tenets of Impressionism was to faithfully portray impressions of real life, particularly those involving ordinary people in natural surroundings, and the effects of light and environment. Many attempts were made to depict fog and mist – a popular effect in Turner’s work, for example – but this remains one of the most captivating and impressive paintings of a foggy day. It also bears all the hallmarks of Sisley’s best work. There is a figure (here not mere staffage, but an important part of the motif which merits a careful passage) but she is part of the landscape as much as are the trees and plants. The facture and surface are carefully controlled, and reflect the elements that they portray. Every part of the painting is built from marks which appear to have been applied quickly, but which assemble into an eloquent whole. They convey sufficient detail to describe the landscape succinctly, but not so much that it becomes slavish mimesis. Its composition is not forced or contrived, remaining natural, and perfectly balanced. The Musée d’Orsay holds one of the best collections of Sisley’s paintings; if you want to appreciate them, it is surely the first place to visit. But of all his paintings there, this is the one that made me gasp. Alfred Sisley, Walnut Tree in a Thomery Field (1880), oil on canvas, 57 x 71 cm, Private collection. WikiArt. A long overdue new catalogue raisonné is being prepared by the Comité Alfred Sisley, but I am not aware of any proposed date of publication. The iTunes Store app Sisley HD (also available in a ten-app bundled The Impressionism) contains an excellent selection of his paintings from WikiArt and Wikimedia Commons, and is strongly recommended despite some errors, most obviously mis-spelling his surname! Posted in Painting and tagged Caillebotte, Impressionism, landscape, Monet, painting, Pissarro, Sisley. Bookmark the permalink. Updated, adding MaryAnne Stevens’ book.